On Wednesday, July 16, exactly five years to the day that Rep. Chris Smith (NJ-04) introduced his first bill to prevent international parental child abduction, the U.S. Senate finally approved Smith’s legislation, The Sean and David Goldman International Child Abduction Prevention and Return Act, House of Representatives Bill 3212 (H.R. 3212). Smith wrote the original proposed legislation in 2009 subsequent to his personal intervention in the fight to bring Sean Goldman home to New Jersey, years after he had been abducted to Brazil by his mother. Smith’s successful work with Sean’s father, David, and a team of lawyers, volunteers and media helped bring Sean home, but also uncovered gaping weaknesses in U.S. law and the need to codify best practices so that other Americans will also see their children returned home. 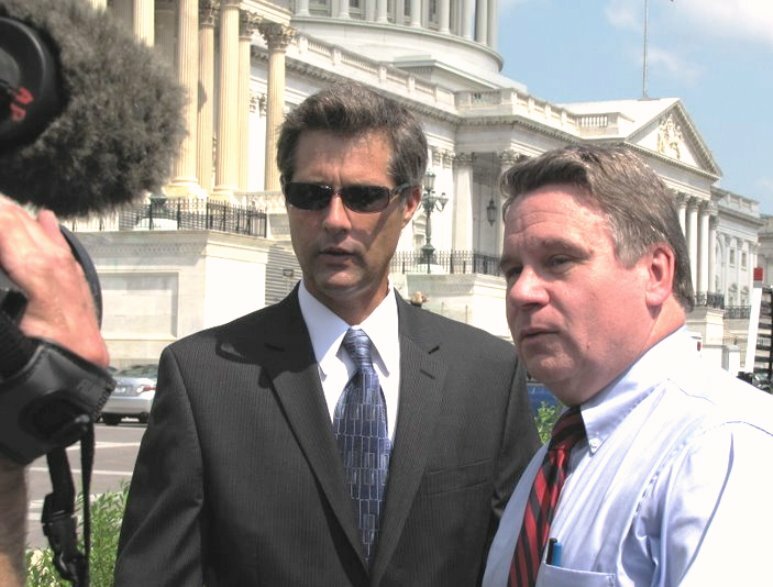 PICTURED: David Goldman and Congressman Chris Smith (R-NJ4), July 16, 2009. At its core, Smith’s legislation will give the State Department a variety of tools to pressure foreign governments to send home American children abducted to overseas destinations. The bill also requires better reporting and support from the State Department so that left-behind parents are not on their own in overseas battles to win the return of their abducted children. During his five year struggle, Smith has authored four versions of the bill (HR 3240; HR 1940; HR 1951 and HR 3212) using each to educate his colleagues and make modifications aimed at winning widespread support in an increasingly partisan congress. In December 2013, the House passed Smith’s bill unanimously, 398-0. Smith said he was grateful that Foreign Affairs Chairman Bob Menendez and Ranking Republican Bob Corker released the bill out of committee to the Senate floor where it passed unanimously in a voice vote, with some final modifications. “In the five-year push to turn this bill into law, we have seen a sea change in the Congress’ and State Department’s understanding of international parental child abduction—an understanding that these abductions are a form of child abuse and a human rights violation. There are many heartbroken parents waiting for this bill to help them in their fight to see their children again. In 2013, Smith named the bill after David and Sean Goldman who have been reunited in Monmouth County for nearly five years. Following Sean’s return to New Jersey, David Goldman has stayed active in promoting the legislation in an effort to spare other parents and children the painful, illegal separation he and his son endured for five years. Smith has held multiple hearings on the heartbreaking cases of left-behind parents of American children abducted to India, Japan, Egypt, Brazil, Russia, England and other countries, from which few are returned. Not all countries have signed The Hague Convention on the Civil Aspects of International Child Abduction, the main international treaty to address parental abductions. The Hague provides a civil framework for the quick return of abducted children to their home country, and facilitation of visitation and contact between parents and children during the pendency of the case and after the resolution. Unfortunately, many Hague signatories, like Brazil, fail to consistently enforce the Hague Convention provisions. a formal request to the foreign country concerned to extradite an individual who is engaged in abduction and who has been formally accused of, charged with, or convicted of an extraditable offense. The bill also—for the first time—urges the Administration to enter into Memorandums of Understanding or other bilateral agreements with non-Hague Convention countries to locate and foster the return of abducted children and protect the access of the left-behind parent to the child. In order to ensure better accountability of the Administration and to warn U.S. judges who may allow a child to visit a country from which return is difficult, the bill significantly enhances reporting on country-by-country performance. H.R. 3212 also requires the Administration to inform Members of Congress about abducted children from their districts. It also that directs the Secretary of Defense shall designate an official within the Department of Defense to coordinate with the Department of State on international child abduction issues and “oversee activities designed to prevent or resolve international child abduction cases relating to active duty military service members. More than one thousand international child abductions are reported to the State Department’s Office on Children’s Issues each year. Between 2008 and 2013, at least 8,000 American children were abducted, according to the State Department. Earlier this year, the National Center for Exploited and Missing Children reported that there have been at least 168 international child abductions from New Jersey since 1995.